Day three of the Next Level Invitational was championship Friday for the NY2LA Basketball Association and the Next Level Invitational saw pool play close and bracket play tip off. There was plenty of good basketball to be had, which meant plenty of top performances. Here are just some of the names from a packed Friday schedule. 2019 6’3” SF Anthony Fairlee – IL Irish Elite – Fairlee proved to be an athletic young prospect. He’s bouncy when in space and can finish in transition. He’s engaged on defense and and shows real promise as a slasher. Fairlee has to develop a jump shot, but his future looks good. 2019 5’10” PG Jaeden Smith – IL Irish Elite – Smith does a solid job of making open threes off the catch for the Irish. He’s patient when initiating the offense. Jaeden is quick off the bounce and handles the ball pretty well. Smith needs more experience as a lead guard, but he has a nice foundation to build on. 2019 Tyler Ellingson SG – RAS Milwaukee – In a close ballgame, no one came up bigger than Ellingson. Making timely, big shots he was a key cog in a single-digit win over the IL Irish Elite as the team wrapped up a 15U Championship win. Ellingson is consistently is a solid shooter for this young squad and his poise late showed he has the foundation of what it takes to make an impact as a shooter late in games. 2018 6’1” PG Nick Klug – Wisconsin Swing Litscher – Klug is an effective scorer. He finds his offense within the team and doesn’t force any of his offense. He moves the ball and finds his space. Klug continuously plays with a high motor and plenty of effort. To top it all off, he’s a consistent deep threat. 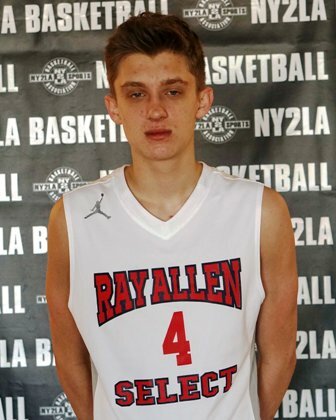 2018 6’7” F Matt Barber – Wisconsin Shooters – Barber is long and fairly skilled for 6’8”. He can handle the ball and stretch the floor with outside shooting. While his shot needs to become more consistent, it’s a part of his game, especially if he has space to get his shot off. Once his frame fills out and if he can develop either a go-to post game or drive game, Barber could develop into an inside/outside threat for some years to come. 2018 6’1” G Bryce Miller – Wisconsin Shooters – Miller proved to be a solid three-point shooter who takes care of the ball. He provides a steady calm to the Shooters’ backcourt and solid production to keep the team balanced. 2018 6’4” SG Ryan Cicenas – Mercury Elite Fano – Cicenas is a lights out shooter who can stroke it off the catch or off the dribble. He shoots it well enough that small schools need to pay attention. If Cicenas can add a consistent drive game and also fill out his frame, he could be a real nice find for a school. 2018 6’5” F Ethan Schuemer – Mercury Elite Fano – Ethan can score it and rebound it very well, especially for someone 6’5”. It’s easy to say that he plays much bigger than what his size would make you think. At his height, he would typically be slotted as an off guard or wing, but given his skill set he can impact the glass very well as you would want a front court player doing. He’s relentless and plays with a high motor. While he does need to develop his jumper more, he’s shown touch inside on put backs after grabbing offensive boards. Once Schuemer rounds out his game, it’ll be interesting to see just how good he can become. 2018 6’ G C.J. Siegel – Wisconsin Playmakers King – Siegel is a tough, quick scoring guard. He can get up and down the floor, especially in the open court, and score it in a variety of ways. He can break his man down and get into the lane, pull up in the mid-range area and also shoot the three. 2018 6’ PG Roman Behrens – Omaha Elite – Behrens is a scoring guard who also shows the ability to find open teammates with vision and playmaking ability. While he does tend to over dribble and his shot selection can be questionable at times, Roman is capable of making big shots as well as playing with a ton of confidence. He can be quite fun to watch and if he can clean some things up, he could develop into a solid lead guard. 2018 6’2” PG Owen King – Wisconsin Playmakers – King is the glue of the 16U Wisconsin Playmakers squad. King sets the tone with his scoring and ability to create for others. His instincts are to be a slasher. He has a solid frame to be able to work his way into the lane off the bounce and score at the rim. He also does a good job moving without the ball and scored a number of times of simply catching passes on the move and scoring in the paint. He takes what the defense gives him and can be pretty efficient when he’s in rhythm. 2017 6’4” SG Marques Wilson – Omaha Elite – Wilson has the look of a player as soon as he steps on the floor. He defends on the ball well and plays tough on both ends. Offensively his total game isn’t complete just yet, but he does show the ability to shoot the long ball. In transition he has the ability to get out and finish in the open floor. Wilson is a player that has a lot of potential upside if he can grow his game. 2017 6’8” F Sam Ohlrich – IL Stars IBA – Ohlrich is a glue guy for a team who can spread the floor as a three-point shooter. He moves well without the ball, finds open space and takes what the defense gives him. He’s a solid prospect who has touch in the mid-post area. If he learns to be more physical inside and assert himself for rebounds, he could be that much better down the road. 2017 5’11” PG Yaakema Rose Jr. – Yanders Law – Rose is absolutely tough. He attacks the paint on drives, knocks down jumpers and helps with solid effort on the glass. He led Yanders Law with 17 points in the team’s 17U Championship loss to All-In Athletics. He proved to be efficient and did a good job of drawing contact. 2016 6’5” WG Isaiah Walton – Yander’s Law – Walton is a long, wiry transition athlete. He’s a key scorer for Yanders and when given space he can deliver some above-rim finishes. He will have to continue to round out his offensive game, including improving his jumper. Once Walton fills out his thin frame and adds consistency to parts of his offensive game, he could be a contributor at the next level. 2017 6’2” PG Teyvion Kirk – All-In Y&R – Kirk has been a top-notch performer throughout the NY2LA Association, so it’s no surprise to see him lead All-In to the 17U Championship title. He can score it at all three levels and excel in the open floor. Kirk has the upside to not only score the ball, but to use his length to be a pest on defense. Plenty of schools should be showing additional interest as the summer comes to an end. 2017 6’ G Keondre Schumacher – All-In Y&R – Schumacher made some big shots and spread the floor in All-In’s championship win. He’s shown he can initiate the offense as well as be a double-digit scorer. He makes sound decisions with the ball and in doing so he limits turnovers, which allows his scoring impact to mean that much more.